Persistent viral infections and tumors drive development of exhausted T (TEX) cells. In these settings, TEX cells establish an important host-pathogen or host-tumor stalemate. However, TEX cells erode over time, leading to loss of pathogen or cancer containment. We identified microRNA (miR)-155 as a key regulator of sustained TEX cell responses during chronic lymphocytic choriomeningitis virus (LCMV) infection. Genetic deficiency of miR-155 ablated CD8 T cell responses during chronic infection. Conversely, enhanced miR-155 expression promoted expansion and long-term persistence of TEX cells. However, rather than strictly antagonizing exhaustion, miR-155 promoted a terminal TEX cell subset. Transcriptional profiling identified coordinated control of cell signaling and transcription factor pathways, including the key AP-1 family member Fosl2. Overexpression of Fosl2 reversed the miR-155 effects, identifying a link between miR-155 and the AP-1 transcriptional program in regulating TEX cells. Thus, we identify a mechanism of miR-155 regulation of TEX cells and a key role for Fosl2 in T cell exhaustion. During persistent viral infections, exhausted T cells (TEX) erode quantitatively and qualitatively and therefore fail to provide protection. Stelekati et al. 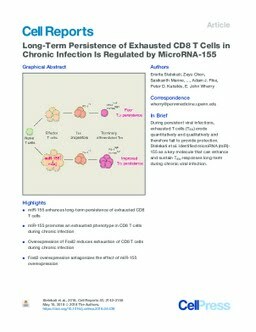 identified microRNA (miR)-155 as a key molecule that can enhance and sustain TEX responses long-term during chronic viral infection.